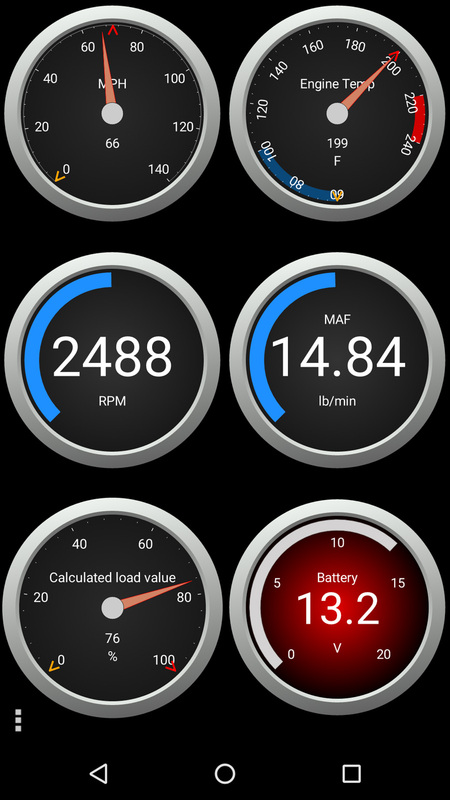 You can turn your cell phone into an engine monitor with just a $20 gadget and a $5 app. This will tell you pretty much everything that a ScanGauge or Ultragauge will, and will also allow you to read and reset generic engine codes. If you want to track some engine metrics in real time, your only options used to be a ScanGauge or an Ultragauge. These things cost over $150 and their displays look like crap. They have small, monochrome LCD screens full of abbreviations. Their only saving grace is that they are a single-purpose device, so they’ll always be plugged in to your vehicle, and because they look so 1980s, nobody’s likely to steal them. More recently, several engine metrics apps have come on the market for cell phones. These make use of the phone (or tablet) display and are highly customizable. They work with tiny transmitters that plug in to the OBDII diagnostic port in the Sprinter. 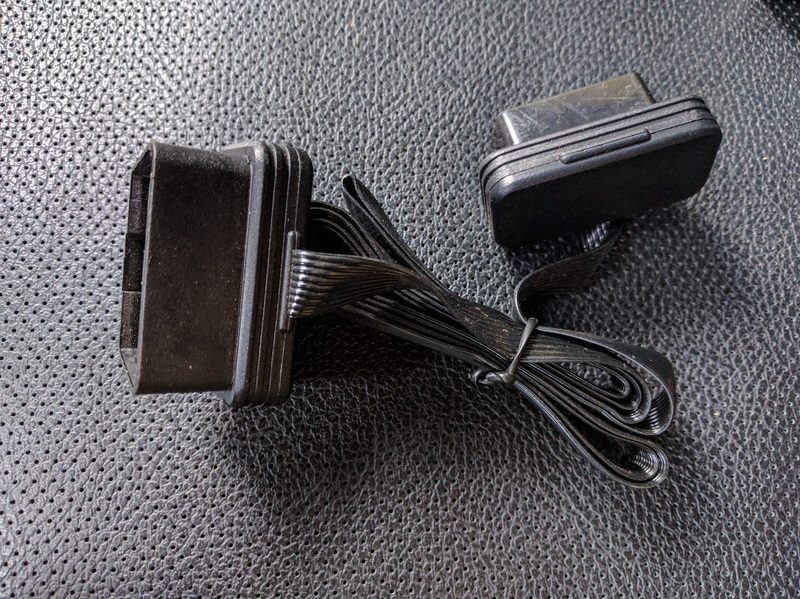 This is the standard socket that all modern cars use for diagnostics, so the transmitter and phone app will work with any other post-1996 car that you own too. Curiosity alone is often a good enough reason to watch engine metrics, but there are other purposes too. The V6 Sprinter engine doesn’t always shift when it should, resulting in poor fuel economy. For instance, it won’t shift down from overdrive on hills, even when the revs get lower than the favorable torque range. With an engine monitor, you can see this in real time (% engine load gets too high) and nudge the shift lever appropriately. For this use, most folks on the Sprinter forum seem to watch % engine load (LOD), fuel flow (GPH), turbo boost (MAP), RPM, and maybe coolant temperature too. On the Sprinter there’s no way in these apps to watch transmission temperature separately from coolant temperature, but there’s probably little need because the trans fluid gets cooled/heated by the coolant anyway, so their temperatures will be similar. If you are trying to diagnose a problem, most of these apps will let you graph one or more sensor read-outs. That lets you see things like how voltage levels change over time, how your driving style affects instant MPG readings, at what speed the gears change (RPM drops), and so on. Watching exhaust gas temperatures (EGT) will let you know when your particulate filter is regenerating (temps climb, stay high for several minutes, then drop again). You can read some of the more generic codes that cause your Check Engine light to come on. The apps give you a brief interpretation of what they mean, and even let you clear the codes. Be aware though that most of the Mercedes-specific codes won’t show up. That’s no fault of the apps. It’s because Mercedes doesn’t share their data freely. Also remember that clearing any codes you find can do more harm than good for emissions tests or if a service department later needs to do diagnostics. 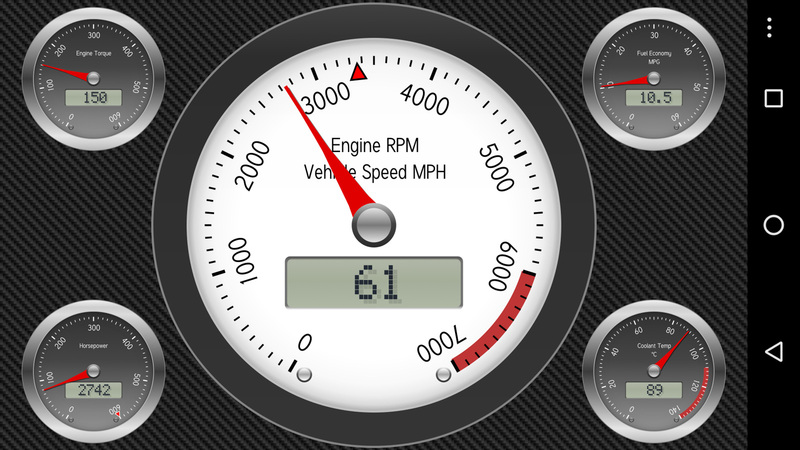 Most of the OBD-II apps will display gauges or digital readouts of multiple engine statistics. Some allow you to get a real-time or historical graph view of these statistics. They’ll also have other screens where you can read any stored engine fault codes. Although some of the apps will reset certain fault codes, none of the ones we’ve tried will reset SRS warnings. For that you need a more specialist tool like the Autel MaxiDiag MD802 (Full system version) that costs around $200. In turn, that tool is not so good for getting real-time readouts of engine stats in the way that these apps are. It’s not the sort of thing you’d want to leave on your dash while you drive. 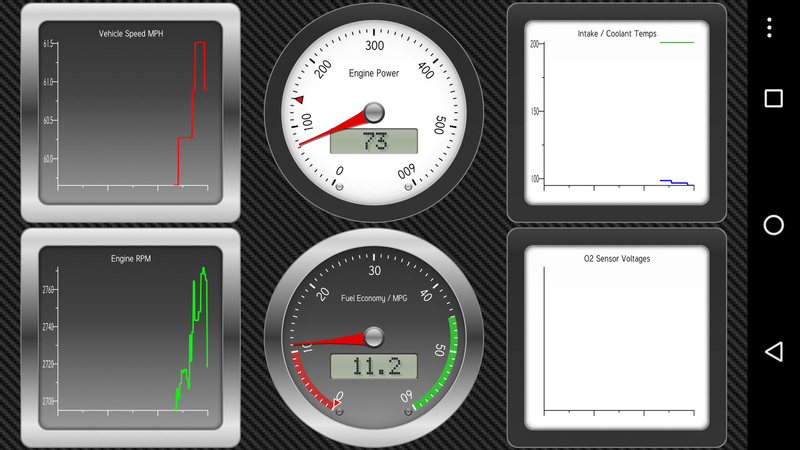 Some of the apps are designed more for fault reading, some are designed more for the gauges. Some are most obviously for the boy racers, because they default to screens with metrics like 0-60 acceleration time or “skid pad” accelerometer read-outs. Check out the screen shots and reviews of the different apps before you buy one. Here are a couple of Android apps we’ve tried. We paid for all of them so that you don’t have to. Torque Lite is a free app. This is a good one to download just to get a feel for this type of app. The free version even let us read codes to help diagnose an issue with a different car. The Torque site has lots of support information, too. 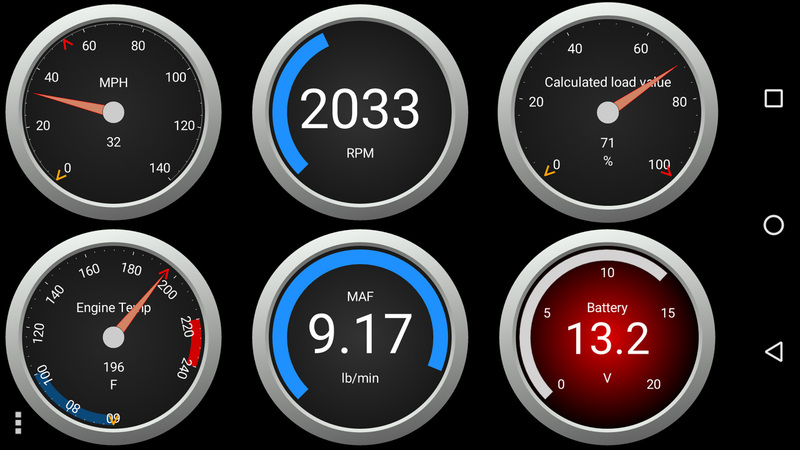 The default gauge design in Torque Pro. 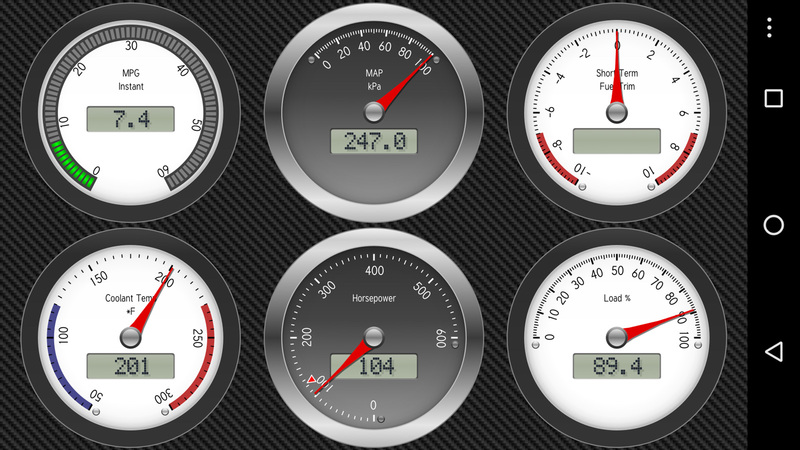 The gauges are quite readable, but could be larger. DashCommand is free to download, but needs in-app purchases to unlock the app for more than 30 minutes of use. This one has “Skid pad” and “Race track” prominently listed on the home screen, and a whole section called “Performance” with the instructions “accelerate to start,” so you can tell who it’s aimed at. The gauges try to be a little too realistic, which makes them slightly hard to read. All the apps allow multiple dashes – once you have them set up, you just swipe between them. The smaller gauges in this dash view are pretty hard to read in real life while driving. All the apps we tried also allow graphing. This is a default graph view that comes with the DashCommand app. OBDFusion is $4 with in-app purchases to unlock other features. Their site has some good support advice. The interface for this app is clean, and the gauges are easy to read. Of the three, this one seems to have had the most thoughtful design input. It’s the one we use now, after trying all three vendors out. OBD Fusion had the clearest gauges. They don’t all try to mimic real-life gauges. Instead they use the phone display well. All the apps let you rotate your phone for portrait or landscape views. Of the apps we tried, OBD Fusion is the one with the right mix of features and the best interface. All three take a little bit of setup, and none of them are as easy to customize as you’d expect, but OBD Fusion has the clearest visual display and probably the most intuitive and easy to use interface and menu system. If you’re an iPhone user, some of the developers offer the same apps on the iOS platform. We have not tried these versions out, but they should work similarly. There are also apps that rely on a particular transmitter. In other words, the company will sell you their transmitter, then you get the app for free. Ultragauge probably realized they were missing out on a major market, so they introduced the Ultragauge Blue. It’s an $80 transmitter that only works with the Ultragauge app. The only thing it seems to do that the generic transmitters don’t is store information even when your phone isn’t attached. Automatic have several apps for their different dongles. The most recent is the Automatic Pro for $130. This company at least puts more stuff in their transmitter. It includes a 3G phone connection and GPS. That means it can do much smarter things than the regular transmitters. Their Pro app can be configured to call emergency services if it detects a crash (like OnStar) and can also interface with other smart devices using ITTT, so for instance you could have your smart outside lights turn on and your smart heating turn up when your car gets close to home. Their old system had a monthly fee. This Pro version does not. We didn’t want the fancy-schmantzy stuff that these hardware tie-in apps offer, so we used a regular transmitter. If you do want this type of device, then Automatic Pro would be our choice, for its visual design, ease of use, and friendliness for non-technical individuals (think about who else might be driving your vehicle). It doesn’t offer quite as much insight into how your vehicle is working but it integrates with many other apps for things like mileage logging or keeping tabs on a teen driver. This device plugs in to your OBD2 (OBD-II) socket and transmits information to your phone. Android phones can use bluetooth or WiFi versions. iPhones need the WiFi version of the device. 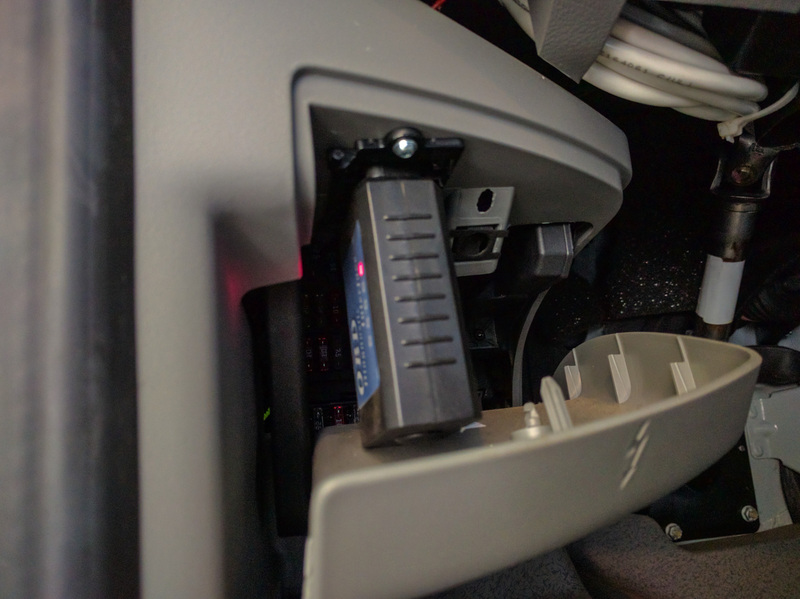 The OBD2 socket is at the front of the fuse box located to the left of the driver’s legs by the hood release lever. Android phones: you can use a Bluetooth device. 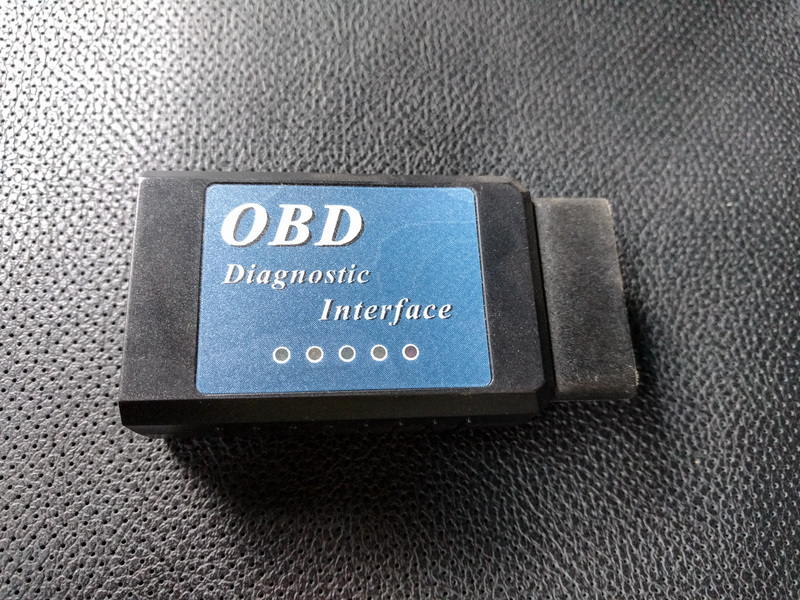 We bought the BAFX Products OBDII Scan Tool. It’s a $20 dongle that plugs in to the diagnostics port in the van. Any “ELM 327” scan tool using bluetooth will do the trick. If you want slightly more peace of mind, a named brand product is the OBDLink LX at $50. It’s made by the folks that created the OBDFusion app. iPhones/iPads: you need a WiFi device. We haven’t used one, but this Panlong WiFi OBD2 should do the trick for under $20. Should I pay more for higher quality? There are much more expensive versions of these products. Rest assured, they’re probably all made in China. The more expensive ones might have better quality control, or they might not. One thing the higher priced ones might do is sample and transmit data faster. We haven’t had an issue with the cheapo one we use though. Some of the name brand ones have other functionality, such as storing data even when not connected to the phone (Ultragauge blue), or knowing where your car is located, and sensing crashes and calling emergency services (Automatic). These additional features mean that the dongles only work with one particular app, made by the manufacturer of the dongle. If you’re OK with that (and the Automatic app is quite nice, just not very data-rich) then feel free to spend the extra money. The OBD-2 port on the Sprinter is not designed to be very accessible. You’ll notice that if you plug in a diagnostic dongle, the fuse box door won’t close. If you want to be able to close the door on the fuse cover that the diagnostics port lives behind, you’ll need a low profile extension cable. The plug on this cable is very flat, so the door still closes. You can then plug the dongle into the socket end of the cable and stuff it out of the way further back inside the fuse box. Now the fuse box door will close. We’ve found it’s best to plug the phone in to a charger while using these apps. They are heavy Bluetooth users, so your phone battery will take a hit. It’s also possible that your vehicle battery will take a hit. We had starting issues after the van had been left for two weeks unused with the dongle plugged in. Typically the battery lasts longer than that before being too dead to start the van. The hardware is supposedly a very low draw item, but we’re just not sure if it caused the battery to go flat faster or not. If you’re watching engine stats on your phone, it’s obviously hard to use it for navigation at the same time. Google Maps will still talk to you, but you can’t see the map. At one point we considered using an old phone we had lying around just for this engine monitoring task. However several of the apps require Android 4.3 or higher and our old phone didn’t fit the bill. It’s probably also a bad idea to leave the phone visible on the dash while you’re out of the vehicle and we’d be much more likely to do that with a second device. Of course, if you have an Android or iOS tablet device then you could use that instead. Most of the apps we’ve mentioned are tablet-friendly. In other words, they’ll sense when they are installed on a tablet and make use of the larger screen size to give you more gauges or larger graphs. We don’t use the app all the time. We used it more initially to get a feel for how the van performs, and at what point we need to intervene and shift down manually when the engine is struggling on hills. We also used it to try and work out WTF is happening when we turn a particular sharp corner on to a hill near our house and the van almost always refuses to downshift properly. Being able to see various engine metrics helped us figure out how best to approach that corner. We haven’t had any codes (yet) in the van, but when the Check Engine light came on in our other car, we just plugged the dongle in and got a good idea of where the problem lay and how urgent it was likely to be to get it fixed. The dongle should work in any car sold in North America since 1996, and most modern European ones too. The apps will also do a “readiness test” for smog/emissions testing. In other words, they’ll let you know whether the computer in the emissions facility will be able to make an emissions reading. They do NOT tell you whether the vehicle will pass the test. It’s still worth knowing this though, because if the vehicle isn’t ready to be tested (if certain parts of the emissions system were recently reset, if the DPF needs to burn off and regenerate, or if a sensor is faulty), then you’ll waste time and potentially money at the emissions test center. For $25 ($20 for the transmitter, $5 for the Android app), this is a cheap and easy way to get a feel for how your van behaves. It’s also much cheaper than an entry-level vehicle fault code scanner and pretty much as effective. 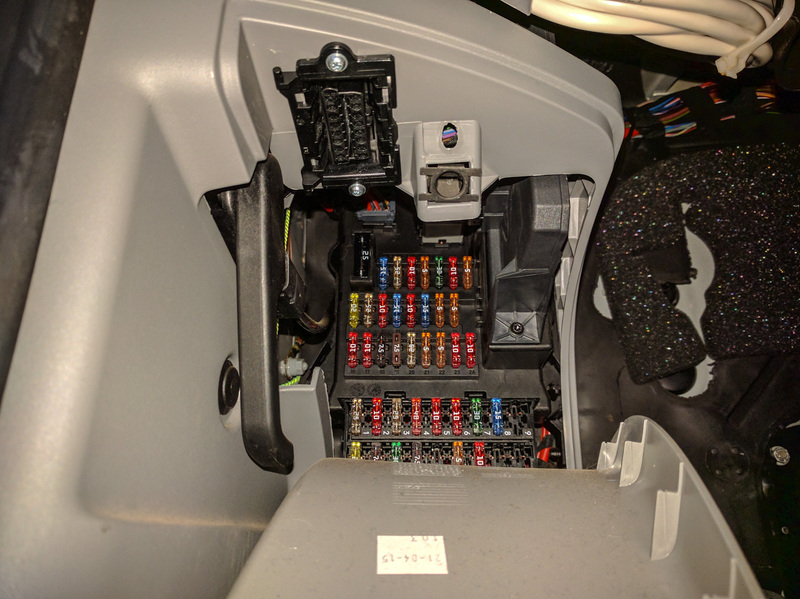 If you think you’re going to want to watch your engine metrics full time, then maybe – just maybe – the Scangauge or Ultragauge may be a better option for you, but for most Sprinter drivers, a dongle and a phone app is probably the way to go. We’d recommend the OBD Fusion app for Android ($5) or iOS ($10) paired with a cheap OBD-2 dongle, or the Automatic app and dongle ($130) if you want a fuller-featured and slightly more consumer-friendly product. For what it’s worth as a review, I grabbed a Panlong wifi dongle to use with obdfusion. It lasted about ten minutes and died. Thanks for taking one for the team, Scott. Sorry you had to be the guinea pig though. I’d be curious to learn more about your experiences with obdfusion. What setting you use and what sensors you are watching. To be honest, since our initial use, we’ve stopped watching things on a regular basis. We had some unexplained van behaviors (not downshifting when we expected, etc.) and watched some statistics to get to the bottom of that. However, during normal driving there isn’t much that we care to keep an eye on. Maybe if we had a scangauge which was permanently attached we’d pay more attention but I don’t think we want to geek out that much. The gauges are really interesting when you’re trying to work out what’s going on. They aren’t telling you much that you can work with the rest of the time. Any chance you are in the Seattle area and have an autel that I could use to reset my srs warning? Hey Jeff, sorry but we don’t have an Autel. NAPA and O’Reilly often have handheld machines they use to diagnose issues. Those might be able to do an SRS reset. If the SRS light appeared because of something like just unplugging the seat cable, plug it back in, drive for a while (a couple of start/stop cycles) and see if the ECU decides it was just a fluke and switches the light out itself. That happened to me. Yeah I put a swivel on the passenger seat and had to unplug the cables. Interesting that yours eventually reset itself. Mine has been on for a couple of months now. Normally it’s completely safe to unplug the cables so long as you don’t have the key in the ignition. I also tend to unplug the battery disconnect next to the accelerator pedal just to be sure. Sorry your light didn’t go out again. Are the connectors properly reconnected? Might be worth a check. Of course, if it’s been on for that long I doubt it will magically reset. The price of the Autel on Amazon is probably lower than how much a dealership would charge you to do the reset. Jeff, we just bought an Autel MD802. Let me know if you still need to reset that SRS code. dieselfumes, thanks a bunch for thinking of me! I was down and in Portland last week and ran across someone with an Autel so they reset me. I tried the scanner at O’reilly down the street first and that did not work but perhaps they just need to update the unit. Would love to have coffee sometime if our paths cross. Michael, I know what you mean about the number of PIDs to log. We played with that feature but never really had a need for it. We don’t use the app very often these days – only when we’re checking something out typically. Although it’s tempting to log a lot of information, my recommendation would be to only do it if you’re sure you’re going to use the data for something later on. Or if you’re trying to troubleshoot an intermittent problem or one that only occurs under certain conditions. The app found a low fuel rail pressure and a couple of glow plugs with issues. I see the sprinter source folks discussing details that are a bit of a mystery at this point. I had hiway speed power loss that took me from the 70’s down to the low 60’s and softer on grades. Not sure what that was. Next PostNext How tall are we? How long are we?